We’re still busy decorating – over two years in the new house now and we have still not got round all the rooms. The lounge and dining room are getting close now – hopefully they’ll be ready in a few weeks as we just have the doors between the two rooms to do followed by the flooring of both. They have been the two most difficult rooms as we use them daily and have done the decorating without abandoning them. 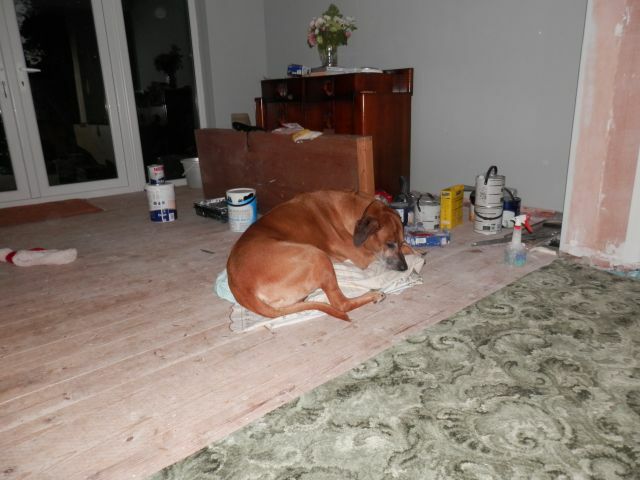 Louis has stoically put up with all the noise, dust, paint smells etc along with his segregation from areas of these rooms whilst paint dries. The front window is still out of bounds much to his disgust. However our furry friend has the unswerving knack of being where the action is. Here is settled down on a pile of dust sheets in the dining room surrounding by bare floors. The object to his left on the floor is actually Louis’ Xmas hat which he more often than not picks up after his dinner and tries to sneak outside to hide it.